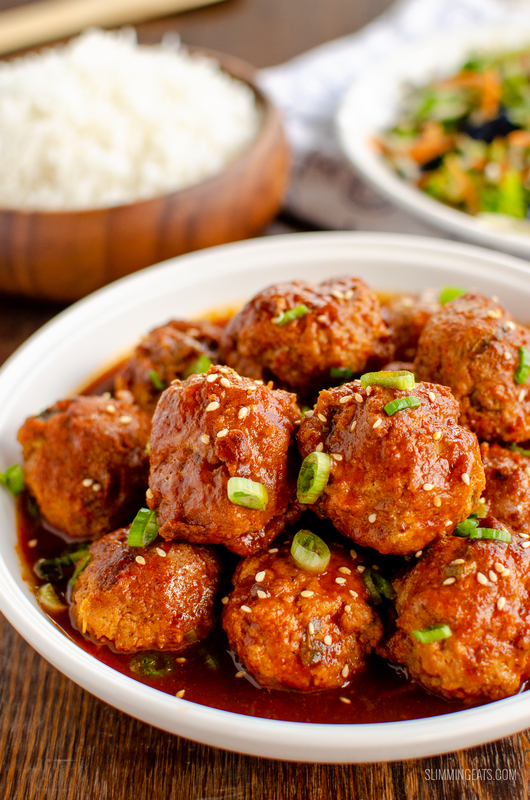 Tender Firecracker Chicken Meatballs in an amazing spicy and sweet sauce, it will become a regular feature on your meal plan. Browsing Pinterest for meatball recipes for the extra lean ground chicken I had in the fridge. 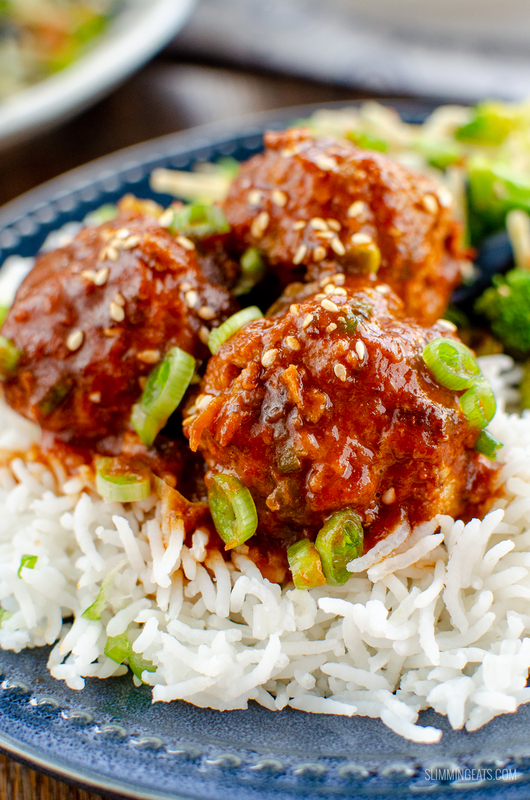 I came across a mouthwatering looking recipe for Firecracker Chicken Meatballs by the Little Spice Jar, that had me drooling at my screen and was totally inspired to create my own Firecracker Chicken Meatballs using my Instant Pot. One of the toughest things when using extra lean ground chicken is keeping the meat nice and tender, as it has a tendency to be dry if you don’t combine it with the correct ingredients. Breadcrumbs and adding some kind of grated vegetable really helps to keep the meatballs nice and tender. You might be tempted to skip on the breadcrumbs to save some syns, but seriously they make all the difference and are not a huge amount of syns when divided into portions. 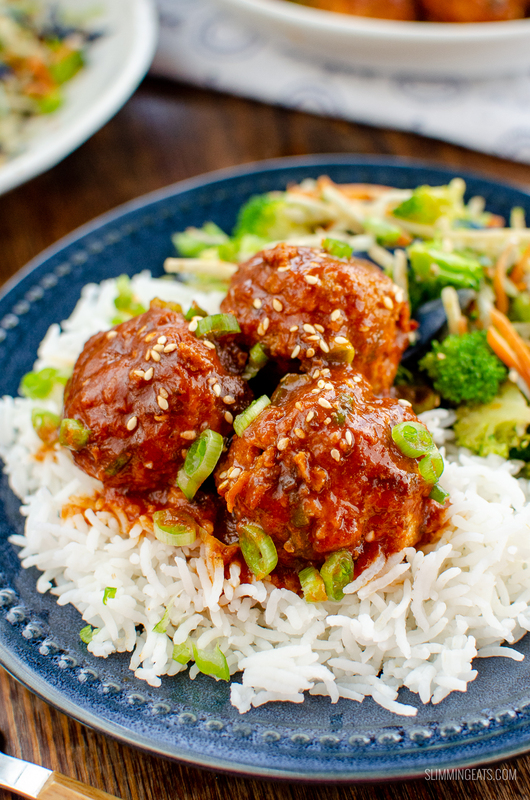 For the vegetables, I added some finely grated carrot and chopped spring onion which I thought would compliment the flavours of these Firecracker Chicken Meatballs. That amazing fiery sauce uses a combination of soy sauce, tomatoes, brown sugar and sriracha as well as the usual garlic and ginger because you can’t have an Asian inspired dish without those in my opinion. 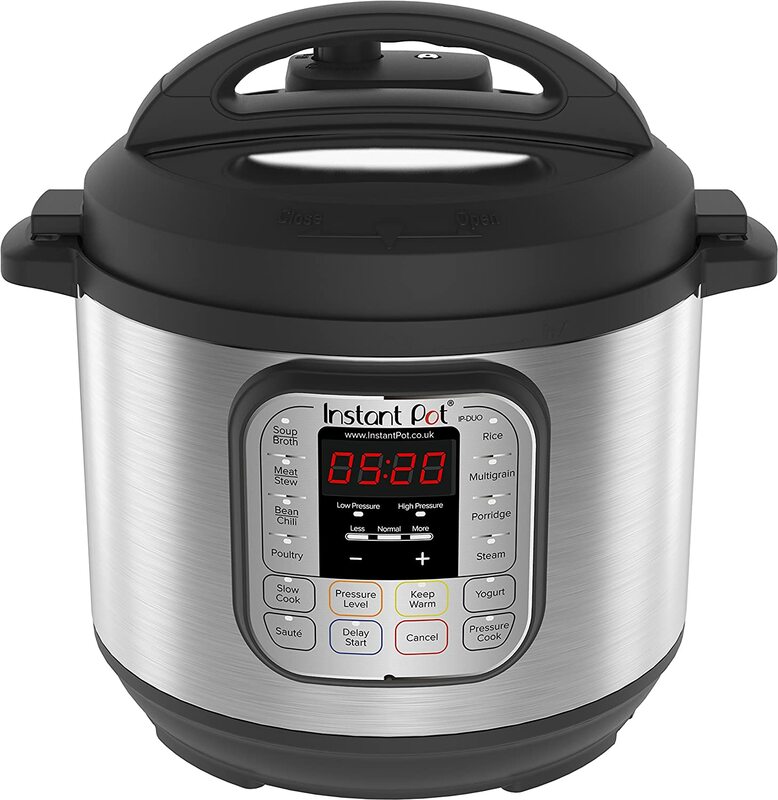 Never heard of an Instant Pot? – you are seriously missing out. It is the best kitchen gadget I have purchased. I love this thing so much, that I almost use it EVERY.SINGLE.DAY. It’s a 7in1 cooker, and it slow cooks, pressure cooks, saute’s, has settings for soup, chilli, rice, porridge and even makes yoghurt (I haven’t tried that yet). Things that would normally take hours can be cooked in minutes and the meat is usually so tender. Looking for some additional support on your weight loss journey? 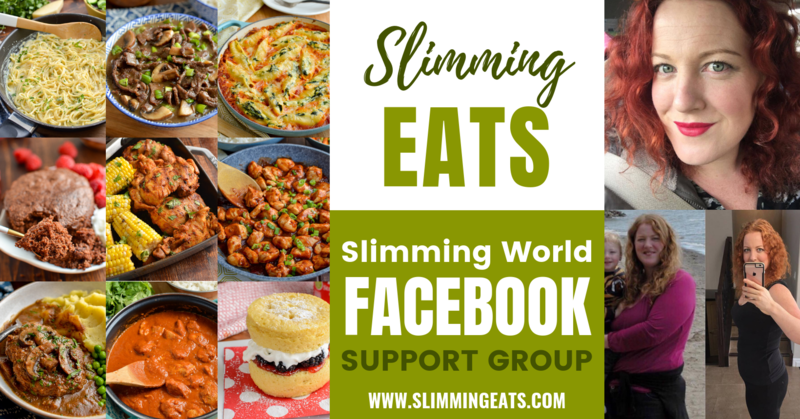 Did you know Slimming Eats has a friendly Slimming World Facebook Support Group where you can get daily meal ideas and recipe ideas? Come and check us out, we’d love to have you join us. or you could even go for some noodles. Need some other inspiration? Check out all these Sides Dishes. 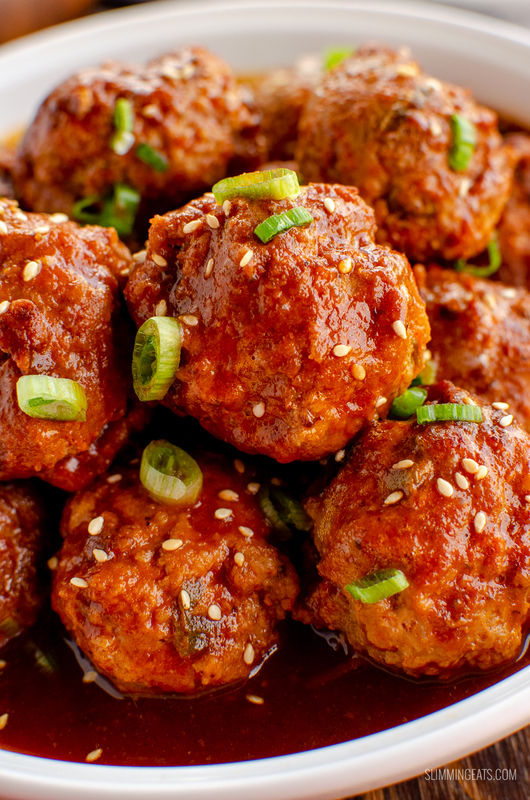 How can I add a 1/3 speed foods to these Firecracker Chicken Meatballs? There of course is the spring onion and grated carrot in the meatballs to this recipe which will count towards your 1/3 speed foods. I also served alongside some stir-fried veggies – broccoli and shredded carrot, broccoli stalks. 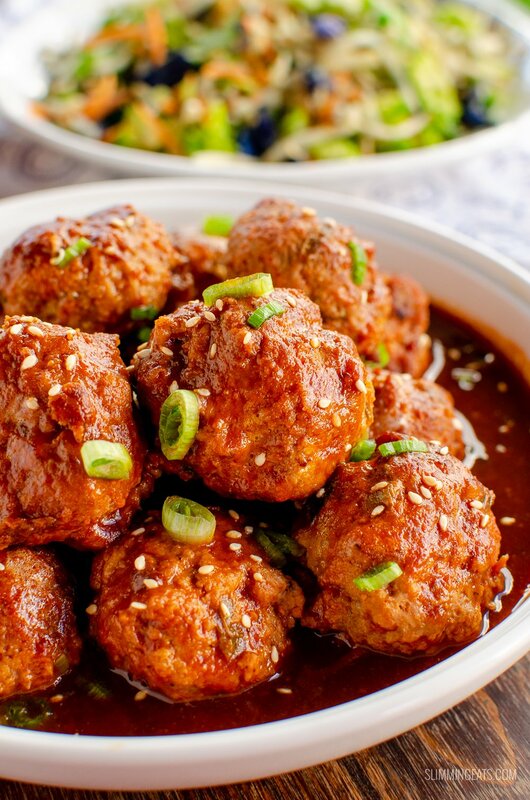 A perfect quick and easy side dish for these Firecracker Chicken Meatballs. Add meatballs and cook until lightly browned all over. Mix together the sriracha, brown sugar, soy sauce, tomato paste, garlic, ginger and water. 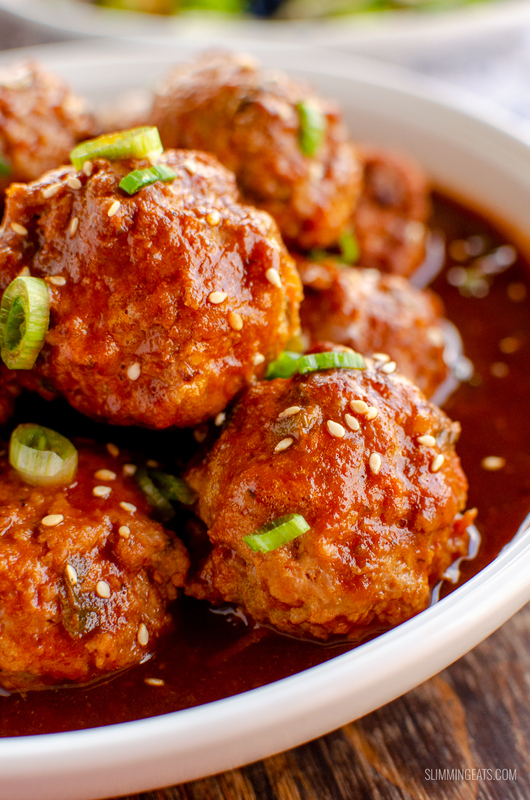 Add to the pan and simmer on a medium heat until meatballs are cooked through and the sauce reduces down into a thicker sauce that coats the meatballs. Sprinkle with chopped spring onions and a pinch of sesame seeds. Set instant pot to saute mode, spray with cooking oil spray, once it displays hot. Add the meatballs (in two batches) and lightly brown all over. Add to the instant pot and stir to deglaze the pan. Add back in the meatballs. Add lid, close valve (if not self sealing), set to manual high pressure for 4 minutes. All pressure to release naturally for 5 minutes then release any remaining pressure. We’ve just had these for our evening meal and they were absolutely delicious. The meatballs were so tender cooked in the Instant Pot. This will definitely be a weekend favourite for the husband and I.